WHY STUDY A DIPLOMA IN BIBLE AND THEOLOGY WITH EDUCATION? This program is designed to introduce students to key theological disciplines of Bible studies, Spiritual Leadership, Church History, Counselling and Christian Ministry. It provides students with a variety of theological courses and practical activities which equip them with fundamental interpretation and application of the bible. The Program is also designed for Christians seeking a foundation for informed participation in the local church, para-church ministries, and in the wider community focusing on faith, spirituality and Christianity, with various aspects of Education and Teaching to provide those interested in teaching as a career with invaluable insights and understanding of the profession. WHO QUALIFIES TO ENROLL IN THIS DIPLOMA PROGRAMME? The Diploma in Bible and Theology with Education programme at GTBC is open to all mature born-again Christian candidates who have a call to serve God. Applicants must have completed senior six, Uganda Advanced Certificate of Education (U.A.C.E) or its equivalent from a recognized institution. Applicants with a certificate in Christian Ministry GTBC or its equivalent from any other recognized institutions, or our Extension Schools, may be considered for this programme. WHAT IF I HAVE STUDIED IN ANOTHER INSTITUTION? If you have studied in another College, GTBC may accept to transfer credits from those previous studies. GTBC reserves the right to assess, accept or reject credits at its own discretion. NOTE: For official evaluation of other college credits, transcripts must be sent directly from the issuing college to GTBC's Academic Dean. 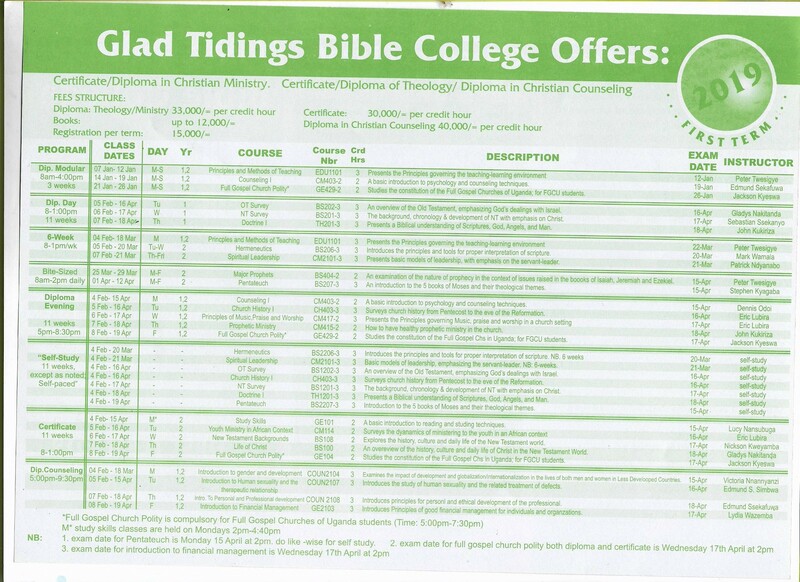 HOW LONG DOES THE DIPLOMA IN BIBLE AND THEOLOGY WITH EDUCATION TAKE? If you are a full time student, then it will take two years. If you are a part-time student, then it may take from 2 to 4 years. The academic year begins in the first week of February and ends in the first week of December. There are three 11-week Diploma terms per year, covering approximately February-March-April, June-July-August, and September-October-November. DO I HAVE TO BE FULL TIME OR RESIDENTIAL? Full Time students study in the morning, afternoon and in some evenings. It may not be convenient for some students to study this way. Students can study part-time and arrange their own schedule in accordance with their needs. Self-Study (i.e. "Study at home") courses.